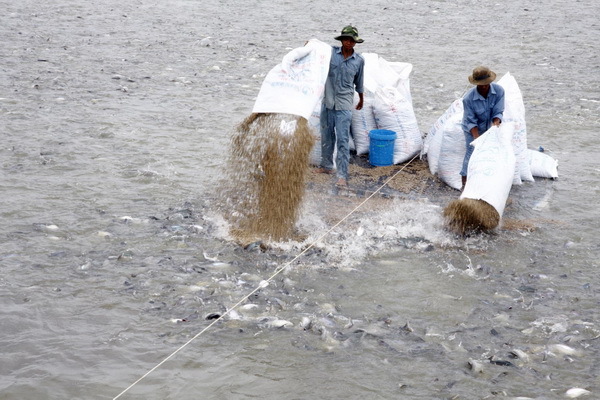 VietNamNet Bridge - Instead of trying to prevent saltwater invasion and desalinizing, it would be better to adapt to the new circumstances and think of developing aquaculture in Mekong Delta, scientists say. In the Mekong Delta, one of the largest key agriculture production zones in the country, alkaline soil accounts for 18.6 percent of total area, located along the East Coast belt and the Gulf of Thailand. In the context of climate change, desalinizing is an impossible mission, or will be too costly. Meanwhile, alum land accounts for 40 percent of the zone’s total area, mostly located in depression areas, where it is very difficult to clear alum. Scientists have warned that saline intrusion would reach more deeply into the mainland in the future as a result of climate change. Le Quoc Anh, head of the team carrying out research on turning challenges in Mekong Delta into opportunities for development, pointed out that saline intrusion cannot be prevented, so the best solution is accelerating the salinization process to serve aquaculture. He emphasized that adjusting to environmental conditions is the most important aspect in agricultural production which helps improve productivity and ensures sustainable development. Saline intrusion cannot be prevented, so the best solution is accelerating the salinization process to serve aquaculture. In fact, farmers also prefer hatching shrimp to growing rice because shrimp brings higher profits. Therefore, despite the ban by local authorities, farmers still deliberately let their fields get salty to farm shrimp in the fields. A local newspaper reported that farmers have even sprayed salt into their fields and ponds to make the water salty for hatching shrimp. However, Anh stressed that it still needs thorough consideration before accelerating the saltwater intrusion process and shifting the land use purpose from rice to shrimp farming. In the alum infected land, it would be better to have one crop of rice and one crop of shrimp. Meanwhile, in the areas where alluvium soil accounts for 29.7 percent and grey soil amounts to 3.4 percent of total area, it would be necessary to preserve the land for rice and fruit farming to ensure food security. In other words, Anh said, it is necessary to apply comprehensive measures to mitigate the influences of climate change and select best solutions specifically for different areas. There is a problem that in the saltwater-stricken areas which have just shifted to aquaculture, the conditions are not favorable enough to farm shrimp. In the areas, the current is usually low and farmers still don’t have experience. Therefore, if not applying reasonable scientific solutions, the water in shrimp ponds will get stuck and shrimp will lack oxygen, while the food leftover and waste will harm farming, thus causing losses to farmers.